Austin — The final week of the Seventh Annual Texas Community Music Festival provided music, mirth and mayhem on the deck at Central Market. The evening began with an inspired performance by the San Gabriel Horns, who delighted the audience with a beautifully executed program of French Horn trio selections. The Austin Brass Band made its second appearance of the festival; one of the handful of ensembles which have performed in all seven TCMFs. And then, as advertised, the evening concluded with a return engagement by the Dead Music Capital (DMC) Band. The zombie-themed “HONK” band paraded, honked and entertained another large weeknight audience. 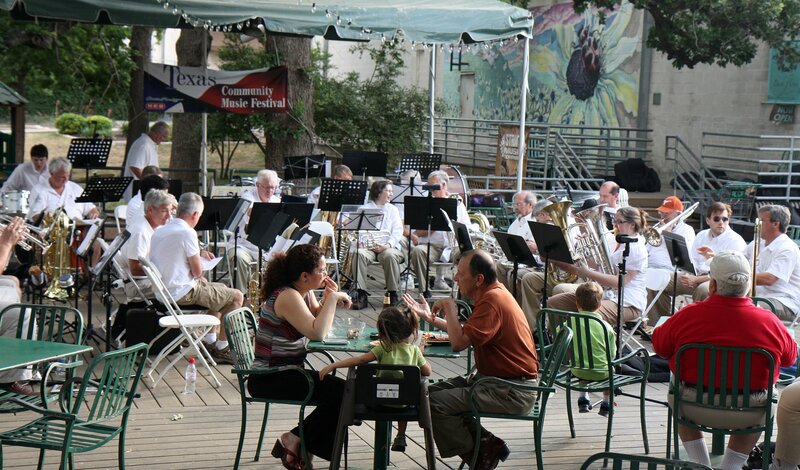 The festival continues Tuesday night at 6:30 with the Blue Diamonds and continues Wednesday at the Farmer’s Market at The Triangle with the Austin Polka Band before the curtain comes down on the 2012 TCMF Thursday at 8pm with the year’s first performance by the Wurst Band. 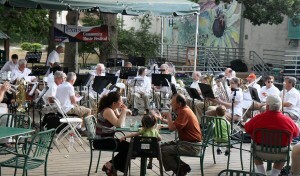 The Texas Community Music Festival is presented by Central Market and the Austin Civic Wind Ensemble and sponsored by H-E-B and Strait Music Company.